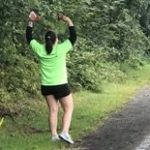 Run Course Captain Deb Povinelli wrote, “Pierson was just before the shortcourse turn around and never stopped jumping, ringing the cowbell, and high-fiving every kid who came by. Her enthusiasm was contagious and many of the kids broke into a smile when they saw her. Best of all, thanks to her location, the racers got to see her twice on the out and back. She brought great energy!” Thank you, Pierson, for creating such a wonderful environment for our racers and all around you. Grace Franklin demonstrated boundless energy as a Run Course Rabbit. She wore a huge smile stepped up to run both courses when needed. Her energy and willingness to help with anything was truly appreciated by all. 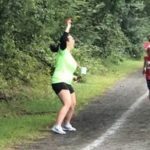 When she wasn’t running, she was cheering on racers in Transition. Juliet Faris was located at the corner where the kids turned into the finish line. As their energy waned, she ran along side racers who needed a little extra boost.